I was thinking about night (and evening) flowers today. 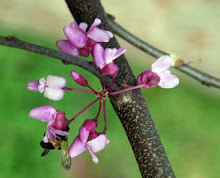 A number of plants have flowers that open up in the evening, or are most fragrant in the evening. Usually, they're pollinated by night-flying moths or beetles or in warm tropical regions, bats. A common denominator is fragrance; moths have a keen sense of smell through their feathery antennae, so flowers that open in the evening often have agreeable scents. 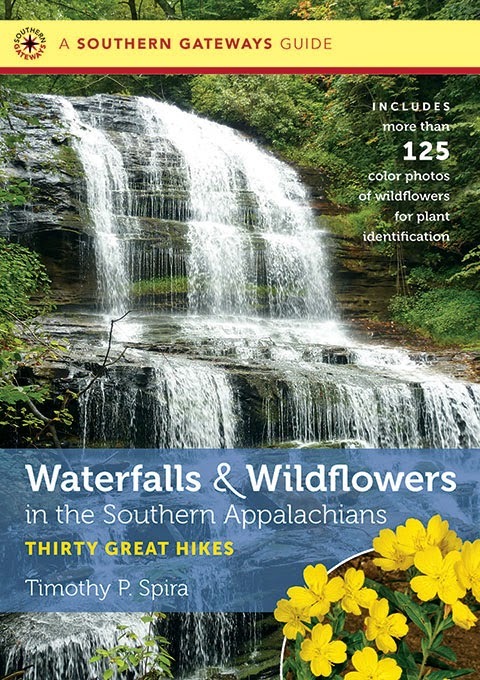 Think about evening primrose, magnolias, four-a-clocks, gardenias, moonflowers, tuberoses, fringetree, and a host of others. They all are fragrant, and luminous in the evening. A lovely book, The Evening Garden: Flowers and Fragrance from Dusk till Dawn by Peter Loewer is a great reference. It was republished by Timber Press in 2002, so copies are still available. 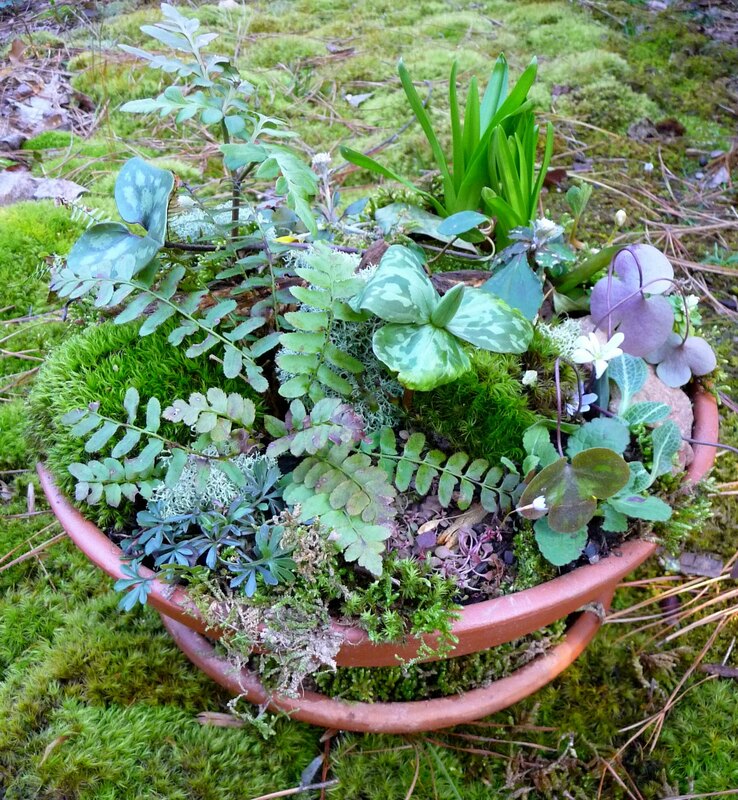 It's an excellent guide to creating an evening garden. We really hadn't planned on a small bog garden, but happened on a display of carnivorous plants at a local plant festival. The keen young proprietor had many of our native pitcher plants, sundews and some Venus fly traps, along with some Australian insectivorous species. 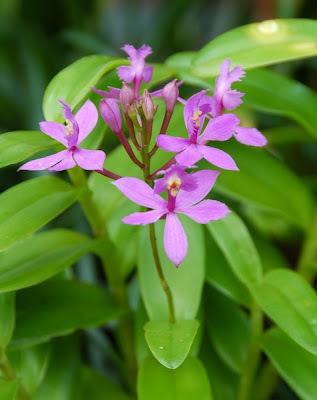 Most had been propagated by tissue culture, he said, and my gardening companion was entranced (he knows all about our native bog plants from an ecological point of view). He set to work digging a hole. supporting a range of rare species. Once widespread, coastal plain pitcher plant bogs have declined because of drainage, development, agriculture, etc. Wetland protection has helped some, but bogs are still rare and threatened here in the U.S., as well as elsewhere in the world. So, with encouragement from the native plant gardener (me), we acquired 2 trumpet pitcher plants (Sarracenia flava), a mountain pitcher plant (Sarracenia purpurea var. montana), and a Venus fly trap (Dionaea muscipula), native to the coastal plain in only a few sites in North and South Carolina. 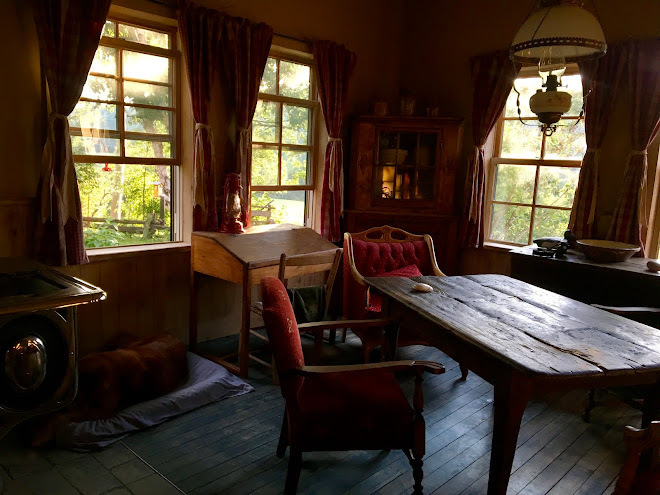 I had assured him that creating a small bog wasn't hard (it basically involves some sort of liner, builder's sand, and peat, along with a source of abundant and mineral-poor water). 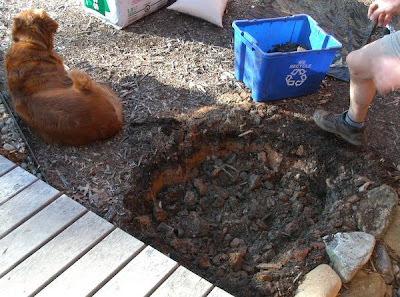 Our gardening assistant provided moral support, as always. 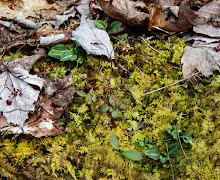 Abundant rain this winter and spring (hooray! 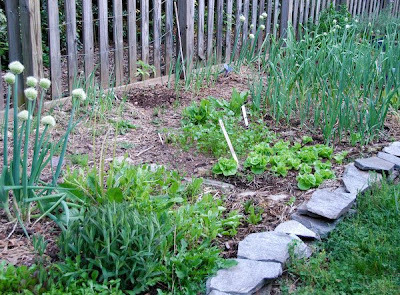 ), along with some very warm days over the last week, has the vegetable garden growing rapidly. 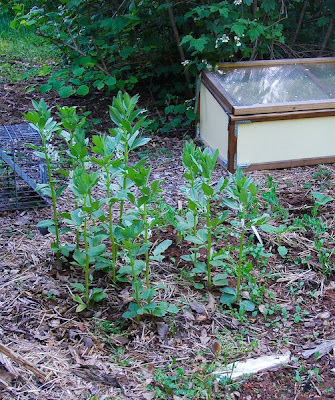 I might actually be able to try cooking some fresh favas (broad beans) this year. There are a few pods on the small number of plants that overwintered. These plants came from seed sown in early February --it'll be interesting to see if they're able to set any fruits before our hot weather sets in. Fall planting followed by overwintering is usually the best method in our climate, but this year's cold winter zapped that! Right now, there are more greens than we can eat directly -- the mustards, Asian greens, and older salad mix will become stir-fries; younger lettuces, spinach, purple mustard, arugula, and green onions, we'll eat fresh. The garlic and onions are looking very promising, and the potato foliage looks great. I'll be planting squash and beans in the next couple of days, if I can squeeze it in -- otherwise, this weekend. 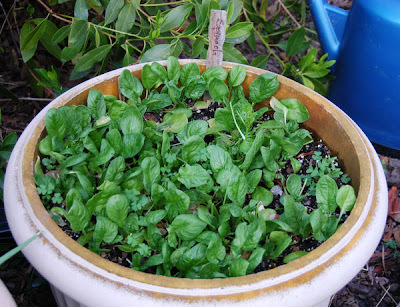 We've had several excellent rounds of spinach from this container (a good amount each time, actually) - yum. This was Renee's Garden Oriental Giant Spinach - totally fabulous, and by far the most productive spinach that I've grown. 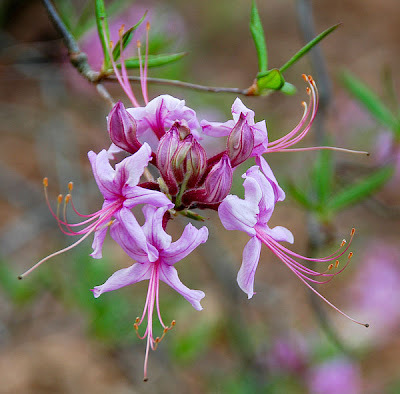 Here are a few images from the native plant collections at the Botanical Gardens of Asheville. 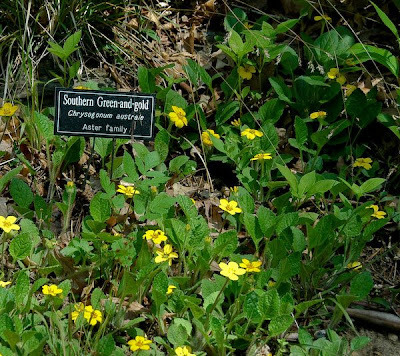 An tough and adaptable wildflower, Green and Gold (Chrysogonum virginicum) thrives in conditions from dry dappled sunlight to damper edges; some plants (from northern populations) are much more upright than the prostrate rosettes common in southern populations. 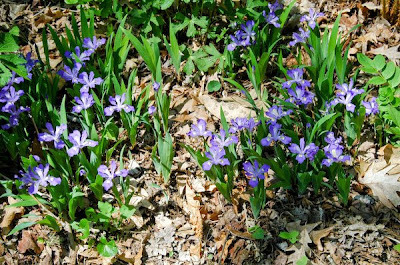 These plants, growing in relatively high rich soil, look robust. 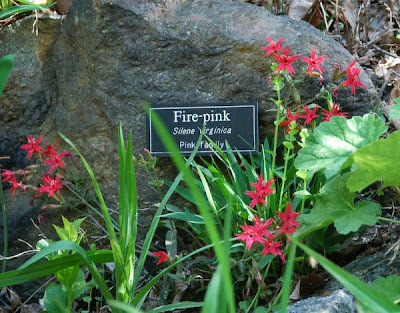 Firepink (Silene virginica) must be challenging to move - I seldom see it for sale as a tranplant. Otherwise, it would be more common as a garden plant! And Iris cristata always is lovely. A weekend in the mountains of North Carolina rewinds spring. 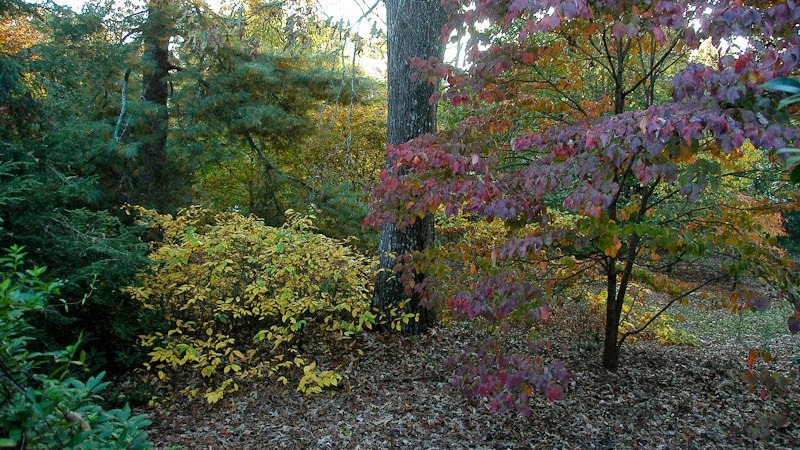 As we climb up in elevation (from about 1000 ft. in Clemson, South Carolina to the 3000 ft. + mountains surrounding Asheville (about 2000 ft.), the leaves in the forest become smaller, the catkins on the oaks and hickories (achoo!) 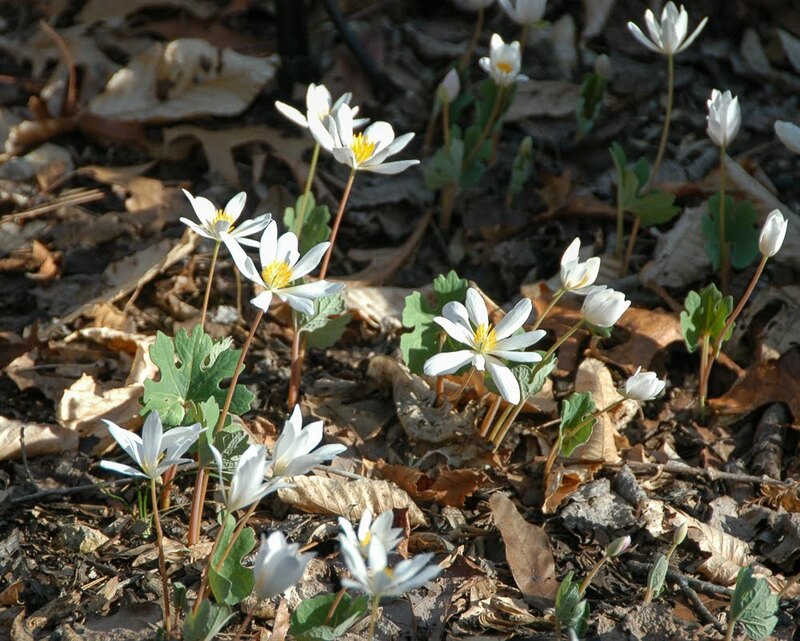 are still in bloom, and it's peak spring wildflower season again. 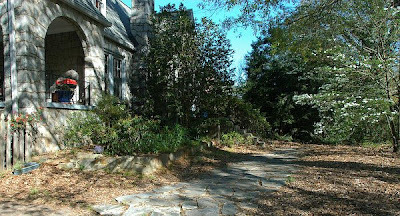 The Botanical Gardens of Asheville, next to the UNC-Asheville campus, has been a favorite place of ours to visit for the last 15 years. 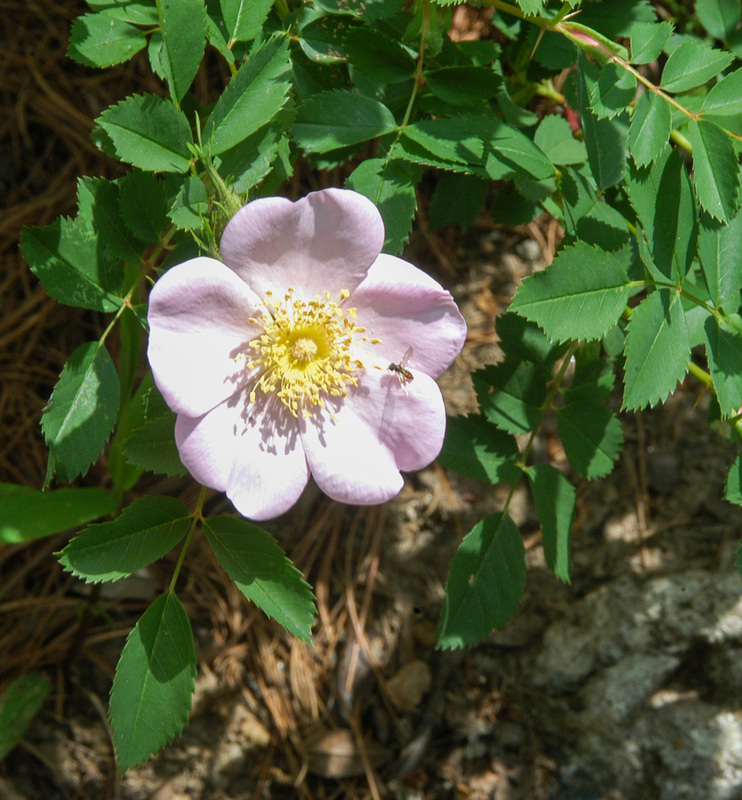 A native plant garden established along a beautiful stream on a sloping, boulder-rich site over 50 years ago, it's a wonderful place to see an abundance of native plants -- wildflowers, shrubs, and trees both in natural and garden settings. Now run as an independent non-profit, it seems to be doing well. 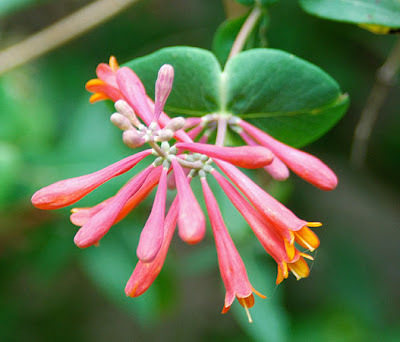 We only joined last year, when we came on an afternoon that the Botanical Center was open, but we've had such pleasure in visiting over the years, just being a basic member is hardly compensation. The only drawback is that it isn't dog-friendly, much to Mocha's disappointment. 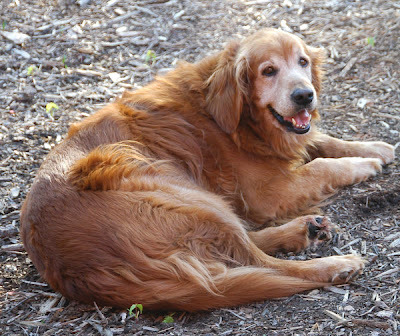 But the creekside setting and heavy use makes dogs a liability that's understandable. I'll have some photos to add tomorrow -- our camera download cables are at home, oh well. The seeds for the eggplants came from Baker Creek Heirloom Seeds and I hope they produce some of the delicious small eggplants that we've enjoyed in SE Asia. Along with a lemon grass plant from another plant sale, I'm prepared for Asian stir-fries. I tucked eggplants and peppers into larger nursery pots, getting ready for a weekend away in the mountains, but put most of my tomatoes directly in the ground this evening. I can't say that I'm being any better about careful planning, but at least I've prepared most of my beds in advance. 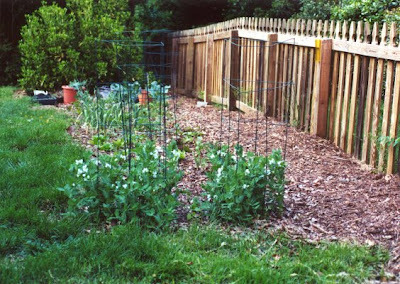 Next week, I'll be planting squash and bean seeds, but it's a dance, with the cool-season peas, garlic, and greens still taking up a lot of space. Fortunately, in our long-growing season, there's plenty of time for everything, even if I don't have the first tomato in the neighborhood. We've enjoyed such great salads lately, it's hard to beat. My flats of salad mix, mesclun mix, pots of spinach, spinach in the ground, Tennis Ball lettuce in the ground, sown mesclun and arugula in various garden plots, and perennial French sorrel are providing totally delicious mixtures of lettuce, mustards, arugula, other greens, and spinach for our dinner salads (and my lunch salad greens on sandwiches, too). There are a lot of good 'salad mixes' out there -- all of our reputable seed companies provide their different custom mixes from spicy Asian to mild Salad mix. And some of them are even available in our big box stores (at least this season)! 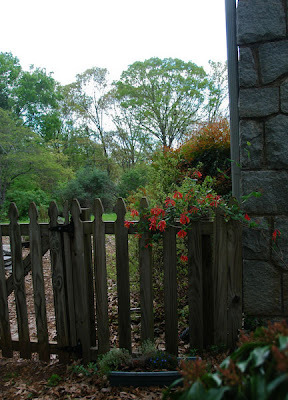 The coral honeysuckle planted next to the gate is thriving. It only had a few (miserable-looking) flowers last year, but my gardening companion confirmed that it enjoys dry weather (like the last few years), so it's seemingly happy now. Or maybe it just needed to get large enough to be suitably reproductive, which actually is a better explanation. It made a striking picture coming back to the house as the light was waning. 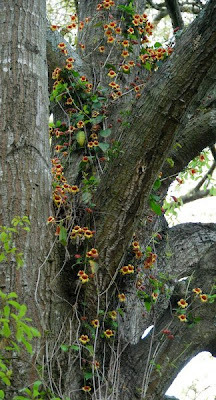 The Bignonia flowering high up in the old water oak next to the driveway -- the clue was a couple of dropped flowers. Otherwise, we wouldn't have noticed it. Happily, what I do at work and my home gardening and nature observation efforts overlap quite a bit. Last Saturday's event at the Garden (Garden Fest) promoting growing your own vegetables and building community was a wonderful gathering centered on one of my favorite gardening passions. All of the folks that we brought together as volunteer staff helped create a wonderful synergy of enthusiasm, combined with an unexpectedly large turnout. 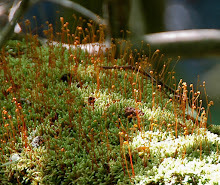 Here's a link to my post on our unofficial 'What's Happening at the Garden' blog. April has been perfect so far. No late freezes. No unpleasant hot spells. It's been rainy (hooray!) Today's weather was exceptional (and 'normal') - a high of about 70° F with a morning low in the upper 40's. The same is expected tomorrow. Coming home, the light was lovely, although still bright enough to fool the camera. I took another picture of our front path; it's really worked out well. And then I admired these lovely Tennis Ball lettuces. A butterhead variety grown by Thomas Jefferson, they're so pretty, they're hard to thin, much less harvest. A nice salad was part of my dinner out on the porch (my gardening companion is off taking photos of spring wildflowers in the Smokies). 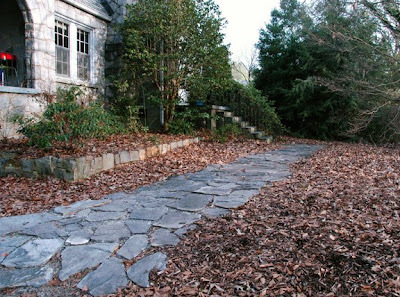 A recent comment on a couple of old posts about laying a flagstone path reminded me of how well our path has held up. My most recent picture was in January (the one here), but I had just been thinking last week about how pleasant it is to have a nice stone path compared to its previous scruffy state. 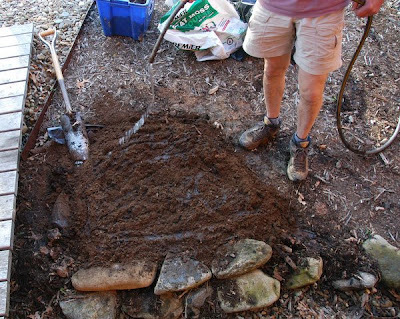 I haven't done any more stone work since then (aside from a small retaining wall next to the shed), and tidying up the wall bordering the main vegetable garden. 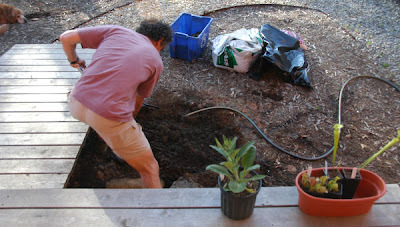 Last summer's extreme drought made the short path and patio below the porch totally unappealing as a project. We've been glad of the rain lately (our drought status has been significantly downgraded, hooray!) But, having warm sunny spring days is always uplifting. We eat our dinner (and lunch on the weekends) out on the porch. The light this evening was beautiful. 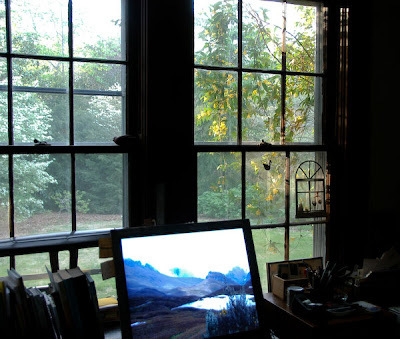 And the view from my study window was lovely, too. I'm always reminded that it didn't always look pleasing, and we're grateful for the transformation. 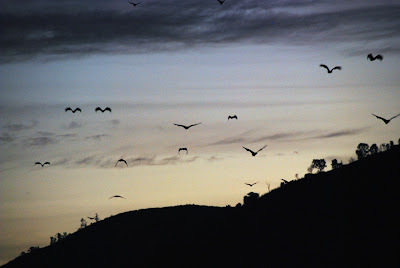 Seeing bats swooping around is always a treat, but a large flock of birds that I noticed at dusk reminded me of the fruit bats that we saw near Periyar National Park, in South India, the winter before last. They were a regular feature that nature tourists like ourselves watched; we went up to the roof of our (modest) hotel to see them, but the upscale posh hotel nearby advertised watching their evening flight. We don't have fruit-eating bats in North America, only insect-eating ones. The fruit-eating bats are found in the tropics and semi-tropics (at least, that's what I remember). 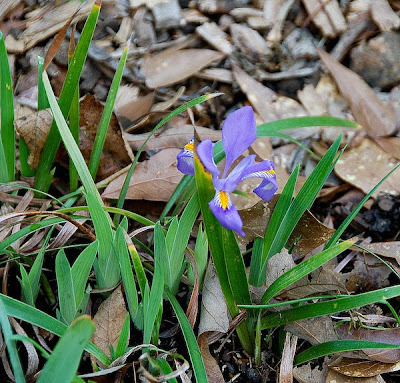 A sweet Iris cristata surprised me yesterday in a spot we'd forgotten we'd transplanted it, near the backyard gate. 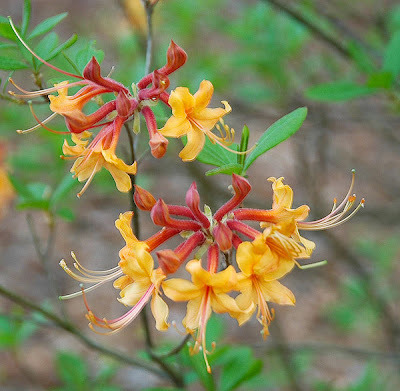 And the Florida azalea (Rhodendron austrinum) and Pinxterbloom azalea (R. periclymenoides) are looking lovely at the Garden. Spring and a first hummingbird! It was a lovely day spent gardening. Today is Easter for Christians, and even though we're not religious, as a secular holiday, it has symbolism as a time of rebirth. 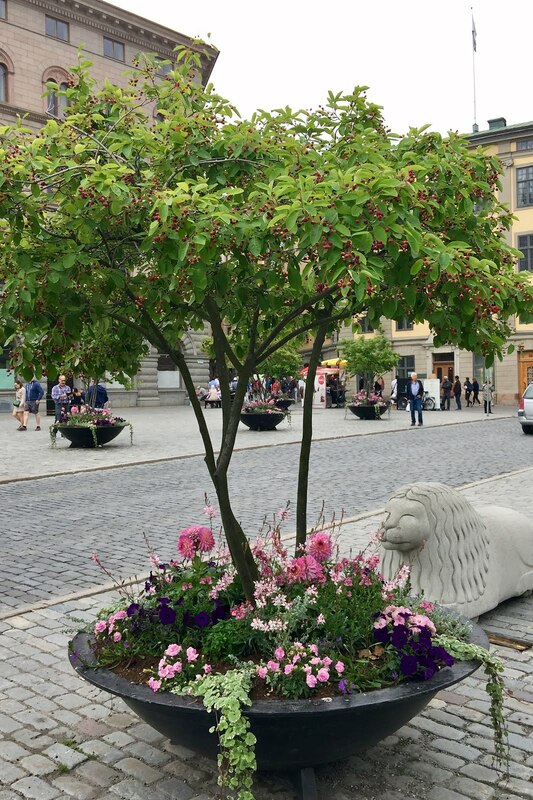 Spring is here. A newly mown 'lawn', borders and meadow edited of winter annuals, a flourishing vegetable patch, and all's right in the garden. 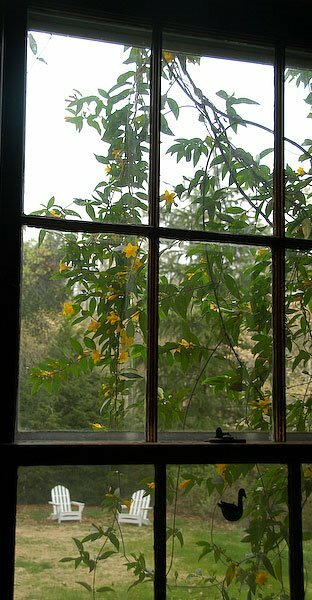 And now, about to have our dinner with greens and lettuces freshly harvested, looking out my study window, our first ruby-throated hummingbird of the season visited a few of the Carolina Jessamine flowers on the trellis out the window. Hooray! 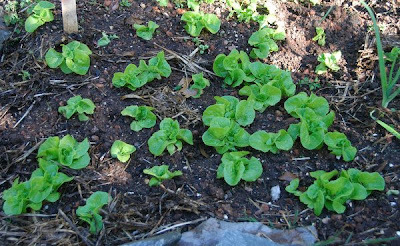 On a perfect spring afternoon, I was able to spend a couple of hours weeding, mulching, and transplanting lettuce, spinach, and radicchio seedlings. 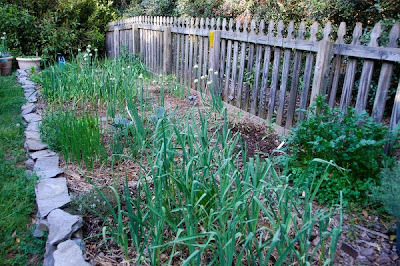 Tomorrow, I really need to pay attention to the meadow and perennial border, but the vegetables -- I guess they're pampered. They need attention, after all, being dependent on gardeners. The tough meadow plants and native perennials in my borders don't need much attention -- just freeing them from the cloak of weedy winter annuals, too many leaves (from my gardening companion's raking efforts), and a bit of final tidying up of last year's stems. Hmmm, clearly I take the 'don't be too tidy' prescription for good wildlife gardens to heart. My gardening companion says he's going to mow the 'lawn' tomorrow. It's gotten awfully shaggy, and if we didn't have (almost feral) neighborhood cats, we'd definitely have Eastern Cottontail nests in some of those grassy clumps. 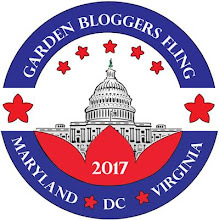 Ed, from Slow Cook, asked bloggers to post about starting a vegetable garden recently, in a post forwarded to me by a gardening friend (CEN). This is a topic I'm totally keen on. At the Garden where I work, we're having an event next weekend to promote vegetable gardening, with the tagline of 'Building Community, Growing Vegetables.' Those of us who enjoy growing vegetables know the joy of harvesting and eating from the garden, whether it's a couple of tomato plants or a series of raised beds or an expansive 'kitchen garden' -- and we're keen on promoting it to others. My first vegetable garden as an 'adult' was modest. We'd just put in a fence (for our old boy, our dog Chessie), who wasn't prone to roam, anyway, but we sprung for picket fence in the most visible areas. I planted snow peas -- and this was just the beginning. My previous forays involved trying to plant onions in the caliche soil of the Texas Hill Country as a teenager, taking on WAY too much space as a young researcher in a field station community garden (and being overwhelmed by weeds), and planting apple, peach, and nectarine trees in a shady Southeast Georgia backyard (I harvested some tasty Golden Delicious apples in the last summer we spent there). But, our soil here is clayey, but our older house has many years' worth of thatch-rich soil below the scruffy lawn, so it's not too bad, with continuous amending. 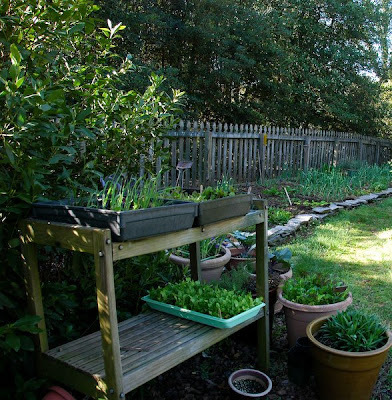 I started small and used Square-Foot gardening and intensive gardening methods as my inspiration. Some years later, I'm talking about vegetable gardening to groups. 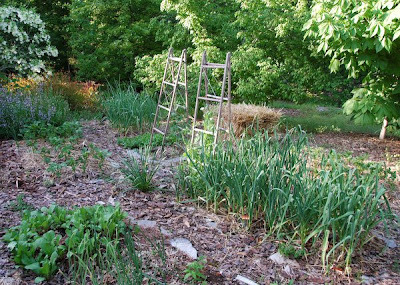 So, what's my advice about starting a vegetable garden? Second: Make it close to the house. 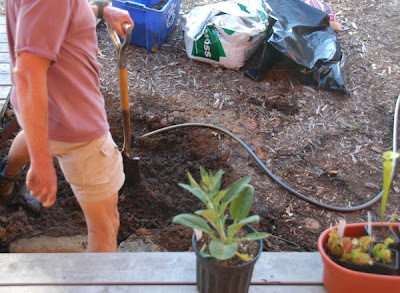 Third: Place your beds close to a water source (within reasonable hose length). Fourth: Grow what you (and your family) like to eat (and don't plant too much). Fifth: Garden through the year (as much as you can). Spring, summer, fall (and winter) work for us in the SE US. Sixth: Remember vegetables are pampered annuals (nutrient and water hogs) and need both rich soil with added (preferably) organic fertilizer and water to be optimally productive. Seventh: Harvest frequently (daily in prime season for beans, tomatoes, etc.). Here are a few kitchen gardening tips from a short video clip (where I somehow was the featured weekly blogger on a local TV station recently). Labels: growing vegetables, kitchen gardening tips, kitchen gardens, nutrients for vegetables, starting a vegetable garden, what does a beginning gardener need to know? A spring night hike found us listening to early crickets, tree frogs, the final songs of resident cardinals, mockingbirds, and chickadees. It was a mild evening, a bit humid, but with signs of spring all around. There were more family groups this time (this is school spring break), and more than I expected (~ 40 people). A couple of highlights were watching bats swoop around catching insects, and the flashes of lightning 'bugs' high in the oak-hickory forest. It's really early for lightning bugs; the warm weather probably encouraged them. 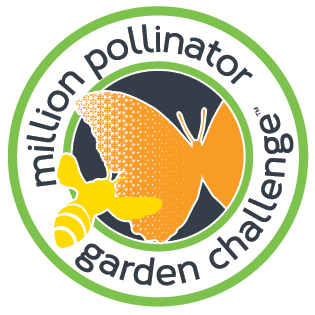 I'm so jealous of my fellow butterfly (and wildlife) gardening enthusiasts and friends in Six Mile, SC. They've now seen two (!) male ruby-throated hummingbirds, one yesterday, and one today. I know from the migration maps on Journey North and Hummingbird.net that there have been sightings of first hummingbirds (through today) here in the eastern U.S. as far north as Delaware, Connecticut, and Massachusetts (and in the Central U.S as far as Michigan). But I haven't seen one yet. Hhmrrph. 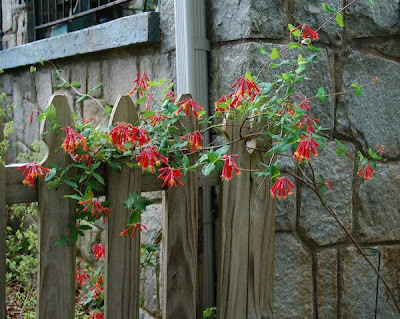 There are feeders waiting, not to mention coral honeysuckle in full bloom and Eastern columbines, but they'll come. And hopefully, one will attract a female to stick around. 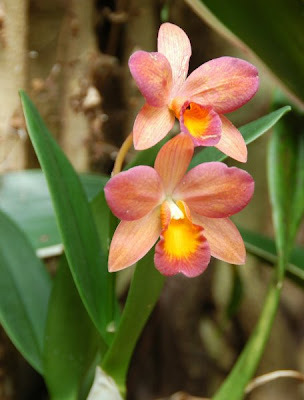 The conservatory at Biltmore Estate had a lovely collection of orchids on display this weekend. 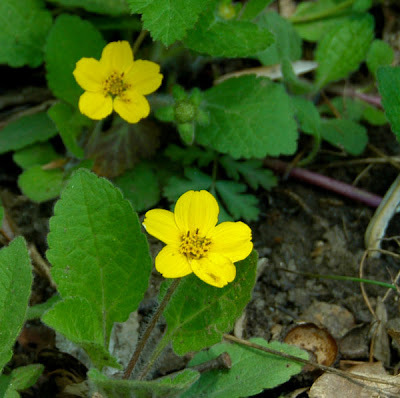 Many were small-flowered, delicate, and certainly appealing. 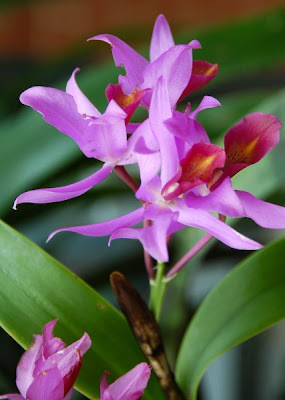 Often orchid displays are full of large, gaudier flowers, which are impressive, to be sure, but not as sweet as these. I've always wanted to see the tulip fields in the Netherlands during spring bloom. Domesticated tulips are lovely, but they don't exactly fit my 'working for a living' screen for planting. 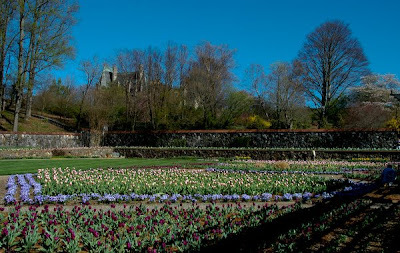 But, I do love them regardless, and this is the first time we've seen them flowering at Biltmore Estate, in Asheville, NC, during the Festival of Flowers. 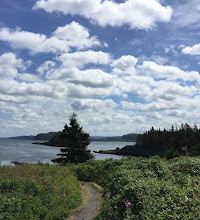 A stop at a granite outcrop on the way to the mountains was wonderful for its butterflies. There were recently emerged zebra swallowtails, tiger swallowtails, and giant swallowtails (I think). Mourning Cloaks (which overwinter as adults) were also flying around. There's a male bluebird perched on a favored bluebird house at the edge of the Garden's meadows (at the botanical garden where I work) almost every morning now. I haven't looked in the box yet, but nesting activity should be well underway. I normally would like to be monitoring the boxes weekly, but this spring has found many gardening programs, activities, and other non-bluebird tugs on my time. Bluebirds thrive in the Garden's varied habitats of meadows adjacent to woods, and we've had bluebird boxes up for many years, recently replaced a couple of years back thanks to a Youth Build program based at our university. We usually have 12-18 successful broods per year from our eleven Garden boxes, with occasional casualties due to black rat snakes (our boxes don't have baffles). In our home landscape, we don't have the right habitat for bluebirds, although occasionally we'll see one investigate. They're lovely birds and have their populations have rebounded with increased placement of boxes to replace the lost natural cavities that they would otherwise use. 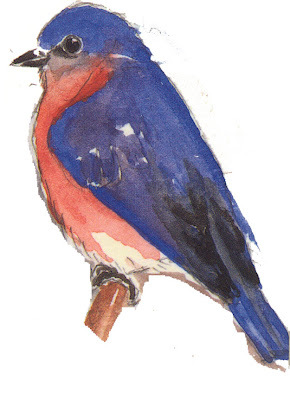 The bluebird image is from a Nature Conservancy birding journal -- quite nice. I wish I could credit the artist. It's tempting when the weather's mild to think about putting out tomatoes and peppers, and sowing seeds of squash and cucumbers, especially when the garden centers are full of plants. It's still too soon for us for the really warm-weather loving plants, based on the last 'average' frost date of April 15. But, there's a progression of sowing as the soil temperatures gradually warm. 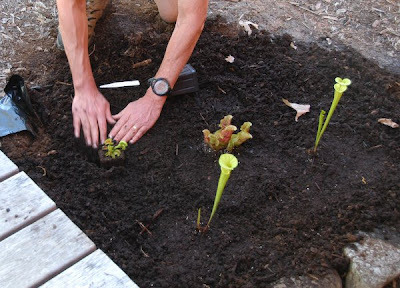 First, the really cold-hardy plants (garden peas, snow peas, sugar snap peas, fava beans, and onion plants), then as spring gets underway (but frost might still be a possibility), planting spinach, potatoes, carrots, beets, chard, more greens, and lettuce. Winter squash seed can be planted now, getting a jump on the long season they need, but basically the seeds wait until the soil warms up enough to trigger germination. It's always an interesting progression, swapping out bed space, checking soil temperatures, and watching the amount of rain and whether a cold snap might be in store. This year, I seem to have an awful lot of space allocated to garlic, onions, and their kin. We quite enjoy all of them, but definitely I'm not ordering so many onion plants next year! Clearly fresh 'scallions' and young garlic will be on the menu to make room for some of the warm-season vegetables. Click on the image for a pdf version of the presentation. 2. to work as a gardener. I'm an educator, writer, speaker, and naturalist, active in outreach around a variety of topics. Visit my website for more information. 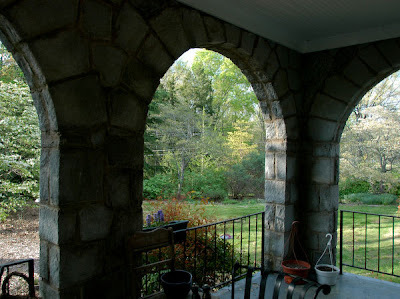 My blog posts span two gardens over the last decade, one in the Piedmont of South Carolina and the other in the mountains of Western North Carolina, and now a new-to-us garden in Bas St. Laurent, Quebec. 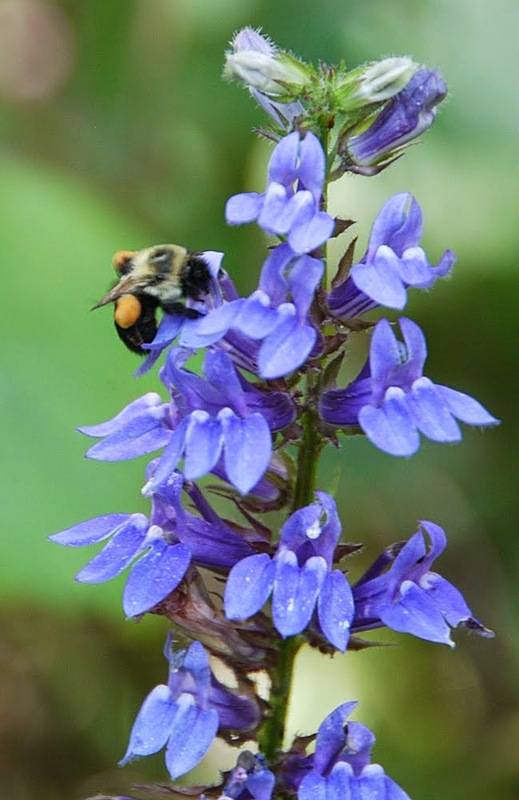 Our gardens have been increasingly home to native plants, birds, small mammals, and insects of all sorts. My gardening companion (my husband) is equally the gardener. 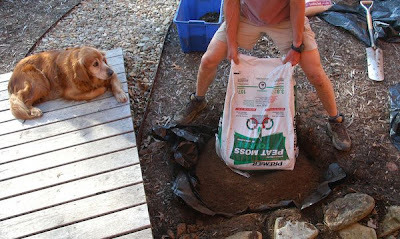 Woody, our rescue Golden, is now our fellow gardener, now in the mountains of Western North Carolina, with new duties in Quebec. 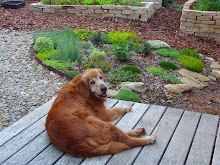 He follows his previous fellow goldens (and my former gardening assistants): Mocha and Chessie. 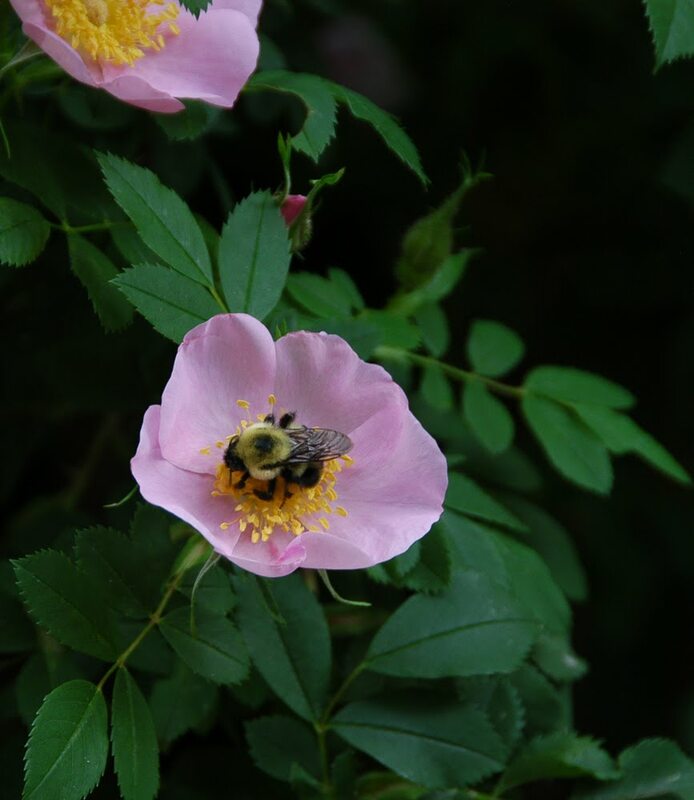 They bring life to our gardens. Click for the pdf version. Click to view the pdf version! Click to see a recent presentation! Click the image to view a pdf of the presentation. Text and images are my original work, except where credited elsewhere. 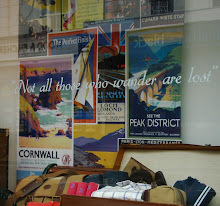 I'm glad to share photos with attribution. 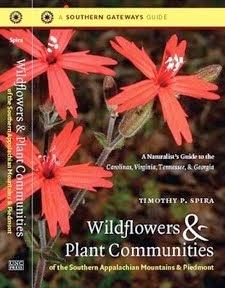 My gardening companion's second book: now available. He had a great run.